Facebook can be one of the most effective tools in your arsenal for generating leads if you follow the steps to maximize impact. Learning how to set up your page, use posts to enhance engagement, join groups, and use paid advertising will put you ahead of the competition and in front of your target audience. 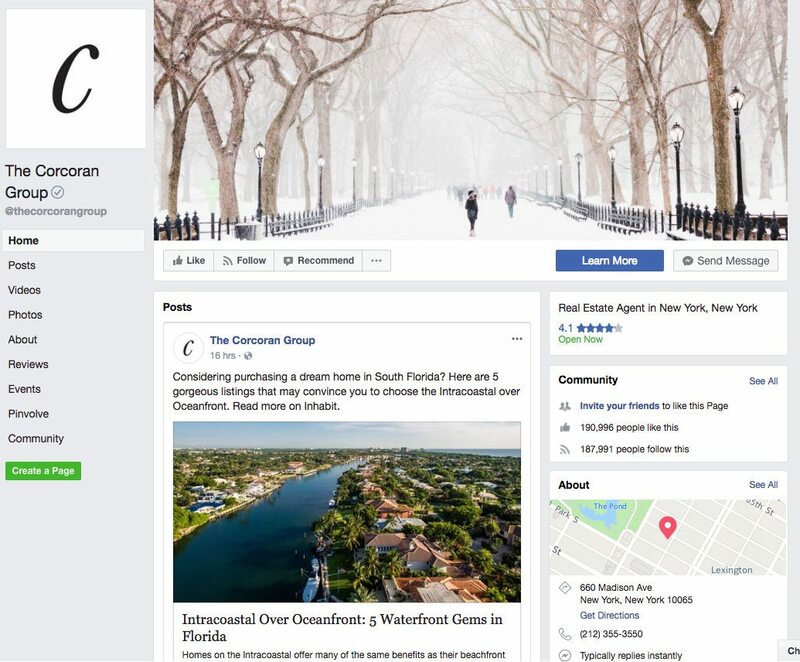 In this article, we’ll focus specifically on Facebook for realtors, and guide you through the process of setting up your first successful Facebook marketing campaign. If you’d rather leave social media marketing to the pros and focus on the real estate marketing you know best, check out Hibu. This official Facebook Marketing Partner can help you build awareness, drive site traffic, and generate more leads with targeted Facebook campaigns. Click here to talk to a representative today. To be present for the people who need your services most, creating an engaging Facebook page is the first step. Here are some ways in which you can use the example above to create your own. Facebook offers a number of options when setting up your business facebook page. You can choose from the following options: local business or place, company organization or institution, brand or product, artist brand or public figure, entertainment, cause or community. Because real estate companies are inherently local businesses, choose the “local business” category when setting up your page over options like “company organization or institution.” It’s important to get the building blocks of your page correct from the onset. Once the basic building blocks of your page are created, you want to be sure that those who visit know exactly who you are, where you are located, and how to contact you. You can see above that Corcoran has clear contact and address information, as well as multiple options available to contact them. Your cover photo should be 828×315 pixels, and your headshot 180×180 pixels. Even though they will display at different sizes, these are the recommended photo size for optimal impact across platforms. Which cover photo you select can make a difference in the initial impression you make. Corcoran in the above example, actually changes the background photo in their Facebook page to match the season of the year. Feel free to upload a headshot instead of a logo, and include a background image that highlights the best of the area you represent. Be sure that your page appears professional for your business, and if you are still struggling with how to get that initial finished look yourself, don’t hesitate to hire someone inexpensively on Fiverr. Initial impressions are worth the $5-20 you’ll likely spend to get this up and running. Facebook gives you the option to select a range of call to action buttons on their site to include. You can see that Corcoran has call to action buttons blow their cover photo that compels people to immediately learn more or contact them. As a realtor, having a button that says “contact us” or “send email” allows potential clients to reach out handily with a touch of a button. An introductory post is your welcome to guests that visit. Posts should be real estate focused, by not always the hard sell. You’ll notice that Corcoran finds a way to integrate their listings in a post that focuses on fulfilling a buyer’s dream of living by the water, and giving them an interesting perspective that challenges convention – that living intracoastal may be superior that living oceanfront. This is compelling and would make a potential buyer want to see the pros and cons that this article provides, particularly if they are already considering living by the water. Give your page some initial momentum, and recruit friends and clients to like your page and leave reviews. As you can see above, there is a button to “invite your friends to like this page,” so be sure to use it! Corcoran might have well over 190,000 likes at this time that certainly establishes authority and brand recognition, but the real value will come in how they engage the audience they’ve got. If you are struggling or would like more direction in the steps to set up your business Facebook page, refer to our step-by-step guide to How to Set Up Your Real Estate Facebook Page. Facebook offers several features that you can use to market to your prospective clients for free. These include posting content, and even contests, that will get engagement from potential customers. While you don’t want to overwhelm individuals by posting too frequently, one to two times per day is recommended. While it is true that you will get the most exposure on Facebook through paid advertising (discussed below), the platform can still offer some quality leads completely without cost. The best free marketing for realtors on Facebook comes through genuine engagement. What kinds of content will people engage with? There is a rule of thumb that people like things make them feel smart, that are funny, or make them feel in the know. 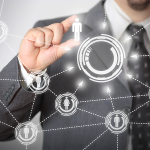 Promote posts or create ads that give people a reason to share that information. The ERA post above is a great illustration of giving readers information. 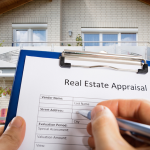 If you are already a consumer considering a foreclosure, you might seek to know more about this, and the agency, after reading a perspective you didn’t even consider previously. It establishes authority. People often come to Facebook to unwind or pass some time. Having something that makes them smile (as well as giving them some information) is usually more than welcome in their feed. As long as the post isn’t silly, unprofessional, or inappropriate, everyone likes engaging with something that makes them feel good. Everyone loves feeling like they have inside information others don’t yet know about. Promote a post that has a great upcoming event no one yet is aware of, make them feel like an insider, and look like one yourself. When you are seen as someone who has their hand on the pulse with the neighborhood, they’ll likely feel like you are similar with the housing market. The above image is an example of an engaging post from a recently developed building that is still selling condo inventory. 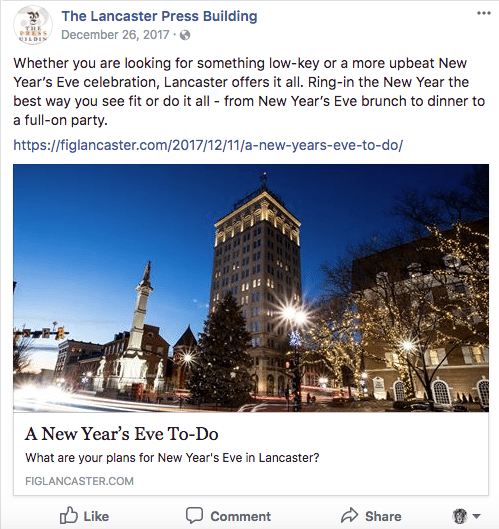 As you examine the post, you can see that the developer finds a way to connect with potential buyers by advertising the perks of living in the small city of Lancaster (and thus, the building he represents in that city). The user that likes this photo likely feels like they know what’s happening in the city (“in the know”). The primary real estate business mistake on social media is to simply broadcasting listings and nothing further. Facebook for realtors requires a very specific type of navigation, and we can show you how to do that in various ways so that customers want to engage with you, leading to a more effective pipeline long term. Sharing your experiences through Facebook groups, trading tips, and connecting with others will likely not only gain you clients but also some friends as well, since Facebook groups are formed around an element you already have in common. There are likely a variety of fantastic Facebook groups available in your area. Some suggested Facebook groups to join are neighborhood groups, pet groups, parenting groups, or any other group that is established locally and centers around a common interest you can genuinely engage and contribute to. Be sure to use the Facebook search feature to find groups that interest you in your area. Realtors can benefit from being a part of Facebook groups, even if they are not the ones making the real estate postings. In the Chestnut Hill section of Lancaster City, homes often sell within 24 hours. Knowing a home is coming on the market before it hits, and having an existing relationship with the seller might give you an advantage other agents just don’t have. The best way to engage with the Facebook groups you join is to be a good digital citizen. Connect with positivity, be uplifting, and avoid getting into debates or negative discussions. Whether constructing an ad or promoting an existing post, Facebook allows you to select the demographic variables, income, and other traits your audience contains to be sure your ad reaches the people most receptive to your message. For example, if you have inventory primarily in the range of first time homebuyers, target these posts to those who are newly engaged, and report a certain income level within your local area. In general, you can expect to pay approximately $11.17 for every 1000 people you reach (CPM), or about 99 cents per click (CPC) when advertising on Facebook although these numbers change rapidly. Promoting a post is when you pay to amplify an existing post from your Facebook stream. The benefit of promoting a post over the traditional ad, is that it can feel more organic to the audience and offer business exposure without the user feeling overtly advertised to. Promoting a post can almost feel like social proof to the audience, especially when they see a post that has gotten high engagement or many likes already. The most recent data from 2017 show that CPMs (cost for 1000 impressions) on Facebook are rising, and currently around $11.17. When constructing an ad, you want to be sure to include an eye catching image, a headline (what you’re about), and a call to action (“book an appointment today”). Try your hand at both types of messages and see which brings you the best audience response. Facebook advertising, when done well, appears seamless to the user. The costs to advertise on Facebook are rising because of saturation and effectiveness. People understand the opportunities that Facebook holds, the impact is great, and realtors who choose not to advertise on Facebook are still missing an incredible opportunity to reach the most potential clients for the best possible price. The difference in utilizing your ad or promotion dollars on Facebook versus other methods is not just reach, but also effectiveness. Most advertising is what is often called a “pay and spray” model. In this model, you are paying to put your message out there to as many people as possible, hoping that someone will be the right fit for the ad and convert into a lead. However, in the Facebook advertising model, you can select what factors the audience of your ad will have, leading to a better match, more leads, and better conversions at a less expensive price point. 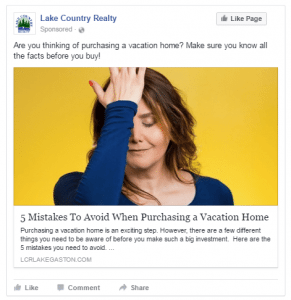 Here is an example of a well done advertisement on Facebook targeted to those looking for a vacation home, but this can be done for any group you may want to advertise to. If you are advertising as a realtor and have a large first time home inventory, you might select factors for your ad to display to people of a certain age range, who are engaged, employed, have a certain income level (that matches with first time homes in your area), and live in zip codes where you operate. Constructing and targeting ads as a realtor using Facebook is much more effective than a pay and spray model. Now that you know the fundamental steps to create an ad on Facebook, we can show you how to capture the attention of your target audience. 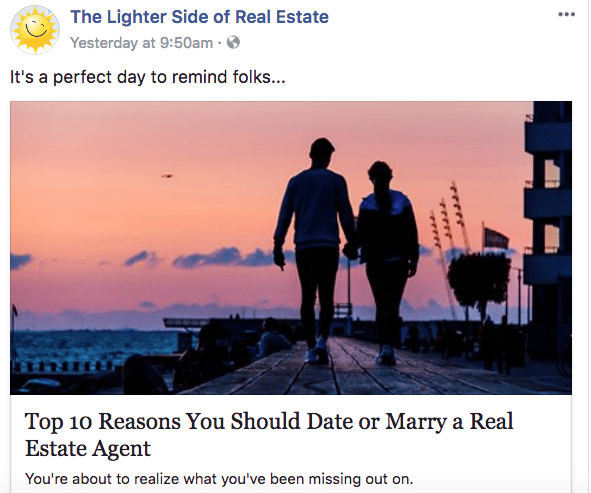 There are some key elements that are proven to help your Facebook ad get the attention you want as a realtor. The best way to relate to your target audience is to know more about them, and formulate ads tailored to what their interests are. This ad is tailored to realtors and those interested in real estate, and if you’re one of those people, this ad should speak to you. Facebook’s “audience insights” feature that you’ve learned about in the ad manager will help you to create ads that are tailored to those who view them. People scrolling Facebook are bombarded with hundreds of advertisements, all vying for their attention. While having a message tailored to your audience is important, realtors using Facebook should be sure to consider the images and colors they use. In the above ad, we have a well known figure in real estate, a bright blue dress, and a red logo that draws the eye towards it. Video is another a way of capturing attention, and you might be shocked to know that you can create amazing video with your phone. The movement and sound of video attracts attention, and creates an interesting visual magnet. If you are using facebook as a realtor, video can take your ads to the next level. A “call to action” is what you are directing the person viewing your ad to do next. When creating an ad for Facebook as a realtor, you want to be sure that you include a compelling proposition that is tied to taking action. Have an irresistible message that lets the viewer know what to do next. Advertising on Facebook for realtors will mean learning a few new tricks technically, but the payoff can be big. If you are willing to learn or hire it out to a place like Hibu, advertising on Facebook will allow you to reach the most targeted group of people, with the least amount of money spent. Facebook provides a lot of options for you to set your budget to promote posts or run advertisements. Within the platform, you can set how much you would want to spend per day (daily budget) or how much you would like to spend over the life of the entire ad campaign (lifetime budget). Setting a lifetime budget allows Facebook to determine when is the most effective time to spend your ad dollars. For example, if you set a budget of $50 to be used over three days, at a CPM rate of $11.14, you will theoretically reach 4,476 people. Facebook will show your post at the best times to reach them over that period until your maximum budget amount is reached. In the lifetime budget option, you allow Facebook to determine how to distribute the dollar amount you set over the duration of your campaign. Most people who are starting the process prefer to control how much they are spending per day rather than allowing Facebook to decide their daily spend given their overall budget, but this is up to you to determine. After you decide which type of budget you want to use, Facebook will ask you to set a bid for the type of action you want the user to take when viewing your ad by paying for cost per click (CPC) or cost per mille (CPM). If you want a user to simply see your ad campaign, you would select CPM. Using a CPM setting, you are paying for the cost of 1,000 views of your ad. If you would like the user to click through to your website, you would choose a CPC and your bid would be for the cost per click on the ad you are displaying. There are a number of factors to consider when engaging in the bidding process, because you are bidding against others who want your audience to view their ads as well. In general, $10 can get you approximately ten clicks with an audience who you’ve set to be well targeted and primed to like the ad and services you are offering. For great tips on how to set your bid, and what type of action to take, we provide a guide walking you through it. The final step of using Facebook for realtors is knowing what how much it costs to run your ad and how to technically set your budget within the platform. Now that you have a page, created an ad, targeted your audience, and tweaked your ad to make it pop, you are ready to get the ad out there! You can expect to pay approximately $11.14 for every 1000 people you wish to reach. For more information on how to advertise on Facebook, read our full guide here. Once you have a business page on Facebook, the question often becomes how to navigate your personal one. Facebook is an inherently personal experience, and your personal page can be a great forum to bolster your business if the integration appears organic. Posting photos of the neighborhood food drive you helped to sponsor as a realtor, for example, only helps to bolster your brand. Content on your personal Facebook page should put forward the very best of who you are. Involved in your community events? Be sure to post it! Allow people to see you engaged. This might also be an opportunity to cross-post to your business page if it’s an activity that you sponsored as an agent. Completing a 10k run for the Human Society as part of your real estate brokerage team is an example of a fun post appropriate on both pages. 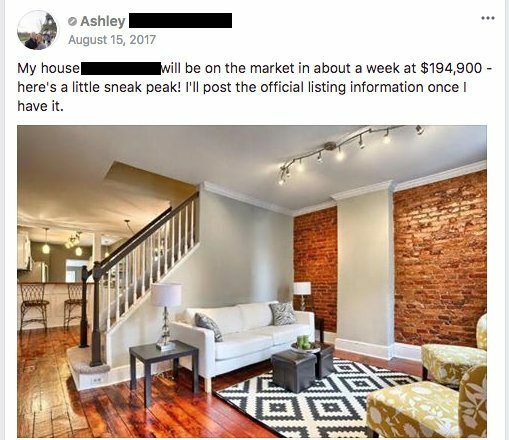 As a general rule, keep your personal Facebook page respectful and assume that anyone researching their realtor will see what you post. Posting to your personal Facebook page shouldn’t be restrictive. People assume your personal page is well, personal, so this is the space to share photos of your family, talk with friends, and periodically remind your circle of a wonderful real estate opportunity if it happens to be something special. 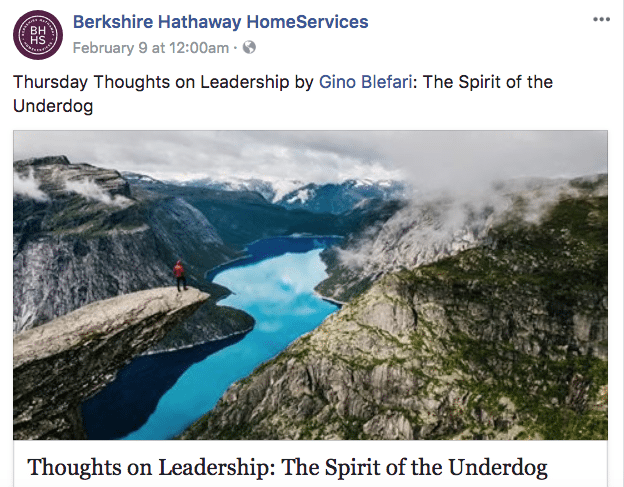 Content for your Facebook business page should be clearly about the real estate business, your area of operation, or specific listings that you have. In those that do acknowledge religious holidays, many will post a kind message for all religious holidays equally. It should go without saying to avoid showing preference regarding politics, religion, or other controversial areas when posting for your business. Building a successful real estate business takes time and effort. Facebook for realtors requires learning some new skills, but a good ad can bring you high-quality leads that can turn into happy clients. If you’d rather spend your time nurturing your existing leads, but don’t want to miss out on the rewards of Facebook advertising, don’t forget about Hibu. Their digital marketing experts can help you create and run successful Facebook advertising campaigns that drive more traffic and leads your way. Talk to a representative today.